Last week a group of food bloggers and myself gathered together to support those affected by Hurricane Harvey by creating Texas inspired recipes and sharing about different relief efforts. Today that same group is gathering together to support those affected by Hurricane Irma. Irma effected areas of the Caribbean, Florida and Southeast United States. Today we are all sharing recipes inspired by those areas, and once again sharing how you can help! When I think of the impacted area I think seafood and citrus. Maybe it's because I live in the Midwest, but anytime I'm on the coast I eat as much seafood as possible. Not to say we don't have access to flown in seafood here, it is just awesome being able to try so many different kinds of fresh seafood while visiting places like Florida. 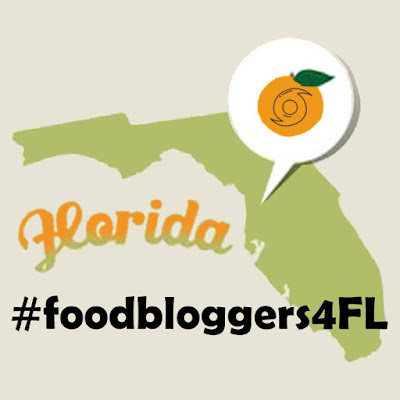 Besides seafood, you can't think of Florida without also thinking of oranges, grapefruit, limes, tangerines, etc. In fact, Florida is the top producer of oranges and tomatoes in the United States. So what to do with all these traditional foods and flavors? Why not wrap them all together in a taco, influenced by the area's Hispanic heritage! Plus I love tacos! So, that is how I created my Shrimp Tacos with Citrus Avocado Salsa. Start your tacos by peeling and deveining the shrimp. Pat the shrimp dry and then coat the shrimp with the garlic, chili powder, cumin, onion powder and salt. Let shrimp sit and marinate while making the salsa. To make the salsa combine the avocado, tomato, onion and cilantro. Then toss with the garlic salt, pepper and orange juice. Lightly stir to combine flavors. The salsa can sit and wait for the tacos to finish. Any leftovers need to be refrigerated. Now start cooking the shrimp. Warm the oil over a medium-high heat. Coat the oil along the bottom of your pan and then add your shrimp. Saute the shrimp til they become pink and opaque. This usually takes 5 minutes. About half way through the cooking process, add the other half of orange's juice to the pan. 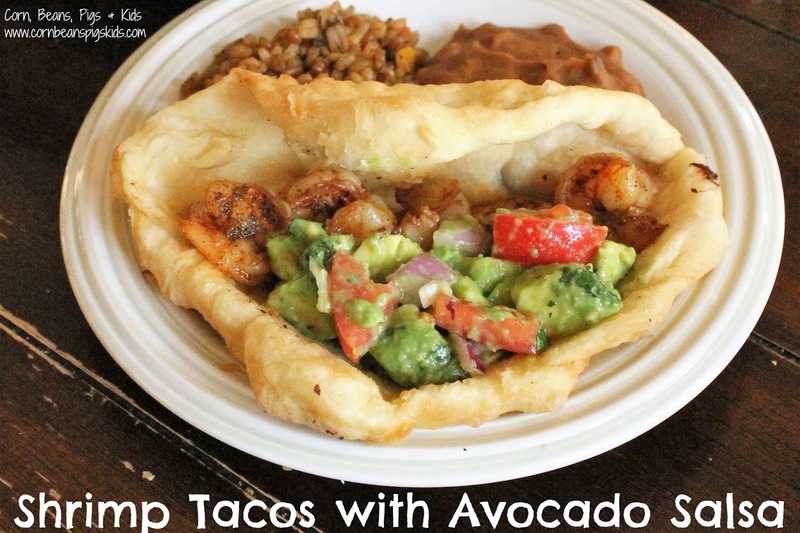 Serve your Shrimp inside your favorite taco shell with the Citrus Avocado Salsa on top! My entire family loves these tacos! My kids consider shrimp a special treat. They are seasoned with a mild spice so everyone in the family can enjoy them. The Citrus Avocado Salsa adds richness and freshness to the taco, with a little zing from the orange. These tacos are easy to make and perfect for feeding a crowd (or a family of six 😉). Please consider donating today and remember to Comment for a Cause! Oh my goodness but these look scrumptious!! Two of my favorite dishes, shrimp and tacos! Yum! Such a worthy cause you are bringing attention to! These tacos look delicious! Thanks for sharing how we can all help. These look absolutely wonderful, Val! My Little Dude is a shrimp lover. That is one of the things he begs for at the grocery store. (We all like them, so it's not usually too hard of a sell!) I need to serve them up this way next time. These sound great! I think my fussy husband, would finally go for seafood in a taco with this recipe! That citrus avocado salsa sounds divine!